Of all the invoices for the month of April of ’97, I only ran across one that rung a bell with a surviving illustration in the archive. 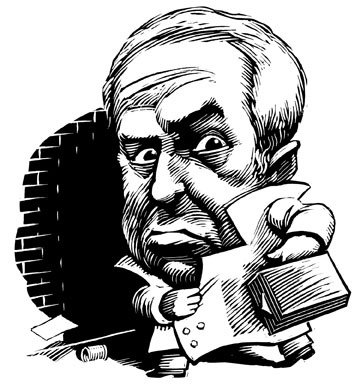 This portrait of Netanyahu was a ‘same day’ illustration for Newsday. I was also surprised to see that I had done some ‘pre-computer’ work for Mary Higgins Clark Mystery Magazine (this was actually the second assignment for this client). I had previously assumed that I hadn’t gotten assignments from that client until after I had switched over to computer illustration. The titles didn’t sound familiar, and I don’t even remember what they looked like. I don’t think the artwork was ever returned, but I could be mistaken. I did a lot of purging of the flat files from time to time to clear up the clutter, only hanging on to art that appealed to me, or for nostalgia’s sake (a habit of mine that I deeply regretted many years later).